Let AJR's focus group work replace doubt with clarity and certainty for you, your clients and your witnesses. If you want to try your case before trial and benefit from lessons learned, focus groups, mock trials, or a combination of these are your best bets. These are often the most cost-effective means of assessing case risks, without risking your investment in the case. They allow you to test your strategy, arguments, evidence, graphics, presentation and videotapes of witnesses and clients on a typical jury panel. 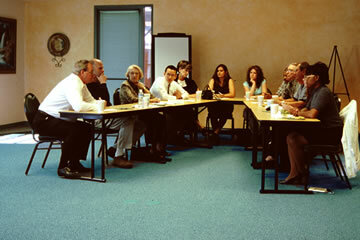 Group sessions can vary from a half day to several days, depending upon the complexity and needs of the case. 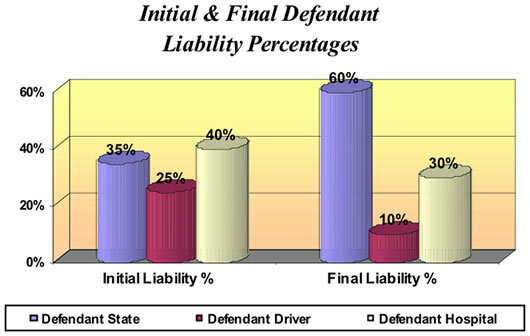 One or any number of groups can be provided for trial simulations. Results are tabulated via a sophisticated scanning and statistical program, and can range from a few hours of verbal feedback to very extensive written and verbal reports, depending on the case needs, time frame and budget. 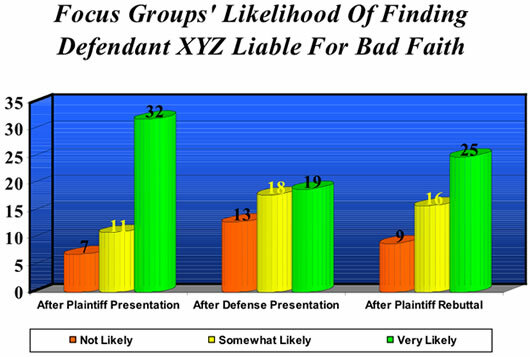 These simulations are excellent for bolstering your case and your confidence, and gaining data for jury selection. The following provides additional information on three options for trial simulations; the concept focus group, the structured focus group, and the mock trial. AJR often does a combination of these to achieve desired goals. Concept focus groups are extremely helpful in the early stages of a case, when discovery is limited. With concept focus groups, you do not need to wait until you have largely completed the discovery process to benefit from "jury" feedback . Participants are read a case synopsis by the consultant or counsel moderating the group, then asked specific questions to generate feedback on a wide range of case-related issues. This information is then used to develop case themes, which in turn direct the questioning in depositions and interviews to support these themes. Concept focus groups help you to find out what jurors assume and believe, and what they need to know to further support or erode this. The ideal situation is to have a concept focus group early in your case, and a structured focus group or mock trial once discovery is largely completed. 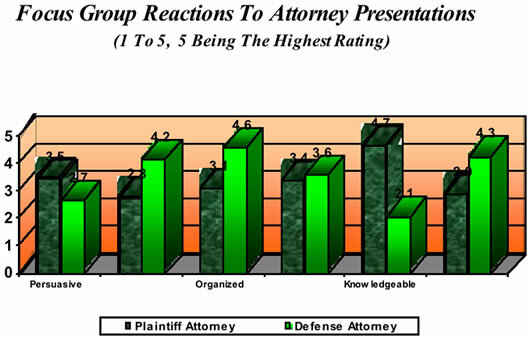 The structured focus group is usually done once the key depositions and discovery process are completed. The case arguments and information are presented to the jury-eligible participants via a written synopsis, an oral presentation, or a combination of both. The jury consultant serves as a moderator for the group, often accompanied by members of the legal team. Feedback is obtained from the group on specific case issues and documents. 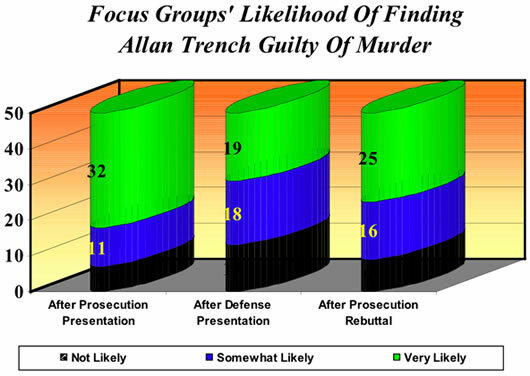 Exhibits and videotapes of witnesses can also be "focused" for feedback, which is obtained via questionnaires and group discussions. Reports, including recommendations, can be in verbal or written form, usually both. Mock trials are often referred to as focus groups as well, and involve a "jury" deliberation process. The mock jurors then deliberate, with the legal team and consultant observing this process in a separate viewing room. Once a verdict is reached, the mock jurors are debriefed and questioned. All proceedings are videotaped. Full reports are provided on feedback to case issues, recommendations, juror profiles, and strategy options. Mock trials are excellent for testing exhibits, PowerPoint presentations, critical witnesses, documents, attorney presentations, case themes and case arguments.